This Tahoe Donner vacation Home is two stories, 1950 square feet, with three bedrooms, two and a half baths. 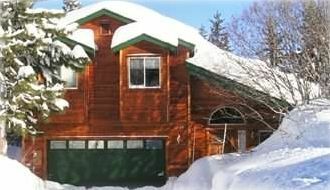 Our home is on a quiet street within walking distance of the Tahoe Donner Ski Hill parking lot and shuttle and has a large, flat yard surrounded by trees that makes for excellent snow play in the winter and volleyball or croquet in the summer. The home is very clean, well-maintained and decorated with newer furnishings, art and antiques; yet it is child safe. Those who cook will enjoy the large, well-equipped kitchen and adjoining dining area that seats ten. The covered deck off the dining room is a great place to leisurely enjoy the outdoors during the spring, summer and fall or stay dry during the winter. The living room comes equipped with a stereo, curved screen TV, DVD/CD player (and videos) and board games. There is a woodburning stove with an ample firewood supply. The home sleeps up to eight. The large Master Suite has a king-size bed, comfortable recliner, flat screen television/DVD, jacuzzi bath, and private balcony. The second bedroom has a single/double bunkbed (and views of the ski hill!) The third bedroom is furnished with a queen-size bed. There is an attached two-car garage with kitchen access and a mudroom at the front entrance. Pets are NOT allowed, No Smoking please. During the winter you are only a short drive from Tahoe Donner's terrific cross county skiing. North Lake Tahoe ski resorts (incl Northstar and Squaw Valley) are all within a 20-minute drive. In the summer enjoy access to Tahoe Donner member facilities including the TD Golf Course, Tennis Center, Equestrian Center, Donner Lake private beach and marina, and Trout Creek Recreation Center and pools. See link below for more information on Tahoe Donner activities, amentities, and access fees. Tahoe Donner is about 10 minutes from the mountain town of Truckee, which offers all major conveniences plus great restaurants and shops. ***Please note the damage deposit option to VRBO's insurance is $500 (not the $2000 which is automatically calculated in the quote if insurance is refused). We will manually update the quote if you wish to book with this option. NOTE: Click on link below to view more photos. We reside in the SF Bay Area (Sonoma County). Mark is in the local wine business and Kathie works for a large Biotech firm. We've owned and enjoyed our Tahoe Donner property for several years and have successfully rented it over this time as well. We made a decision some time ago that we don't expect rental income to cover the costs and therefore don't keep it rented all the time. We'd prefer to keep wear and tear to a minimum and therefore tend to shy away from very large groups, last minute discounts, etc. We always check to ensure our rates remain reasonable and amenities are competitive. We had stayed in various rentals around Tahoe Donner for many years. We love the area and wanted a home that would provide family time and memories. A place that was enjoyable in winter AND summer. We wanted a home that was clean, comfortable, and not full of second hand furnishings. Lots of snow (house is at 6700' elevation), but without the wind of the homes on the hills or steep, winding, icy driveways. Not only has this house has fit the bill for us in the above ways, we love the layout. Nice sized bedrooms, open kitchen to the large dining table, easy garage access, great covered deck off the back to enjoy a cup of coffee or glass of wine. An additional bonus is the Tahoe Donner location. Close to Truckee, Lake Tahoe and the big resorts, yet located off the 1st exit coming into Truckee. Saves us 30 minutes both in and out (and that's without weekend traffic!!) On a Friday night or Sunday afternoon this is a non-trivial benefit..
We have several favorite Tahoe Donner amenities. During the winter, the local ski and sled hills are fun and convenient. In the summer, we enjoy walking and hiking the awesome trials, going to both pools, boating on Donner Lake at Tahoe Donner's private beach and Marina. While not golfers, this is one reason many owners buy and live here. Having a local Bar and Grill and a pizzaria is terrific as well. We often go into Truckee for shopping and restaurants (favorite Mexican restaurant in N Cal is El Toro Bravo), drive around Lake Tahoe, or ski Northstar, Squaw or Sugar Bowl. Well-equipped for cooking, baking, and entertaining. Basic pantry items. NOTE: Tahoe Donner Ski Hill. Home is on a quiet street adjacent to the ski hill parking lot and shuttle.